Here is Ozotic 521. Two coats over black. 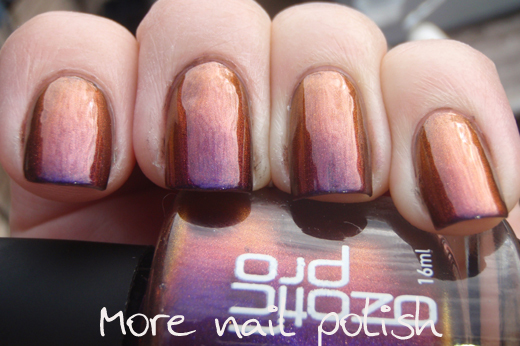 The base colour is purple, and the multi chrome shift is maroon, orange and gold. Application with these Ozotics is so easy, they just glide on. The hardest part is getting a nice neat edge to your black base. I love the big bottles and rubbery grippy tops too. 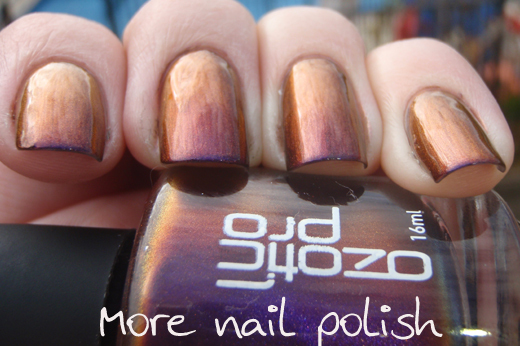 I'm still rather amazed that other polish companies haven't started producing multi chrome polishes like Ozotic Pro does. They pretty much have the market cornered, which is great for this Aussie polish, and great for piCture pOlish whom you can buy them from. 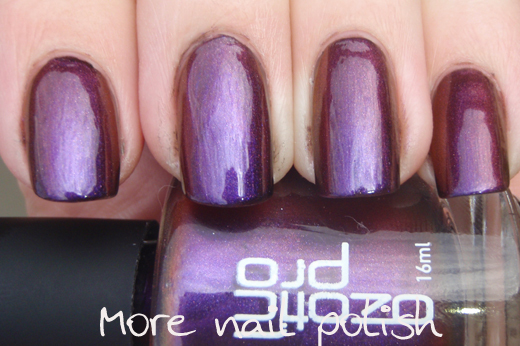 And in case you were wondering, this is my second least favourite of these multi chrome Ozotics. Still spectacular, but if I'm putting them in order, this one is closer to the bottom than the top. I'm loving these Ozotics! I'm having such a hard time narrowing down which ones I want to order between these multichromes and their holos *sigh*. Gosh,this is just gorgeous,Kitties. Yes,there should be more companies that make multichromes like this,especially in the States. I'm having difficulty comparing your artform 508 and Ozotic 521. Can u tell me are they exact dupes? Or there is difference? Jia - I thought they were dupes, but I'm not so sure now, I'll do some comparison swatches and post them. Thanks Kitties26. Looking forward to your comparison.